The crisp air, the changing and falling leaves, the beautiful lights all mean it is time for the holidays. I'm highlighting some of the events around the area over the next few weeks that you just might want to attend to help get you and your littles in the mood! Holiday Magic is always a fun time at the Sacramento Zoo. 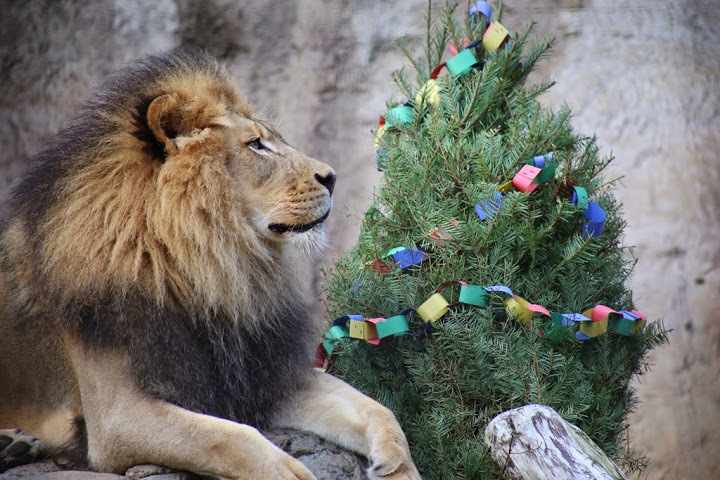 The animals get to open their presents a little early - on Dec. 12. Lucille enjoyed this last year and I hope to go again this year. We love our little zoo! If you aren't a member they are doing a food drive - bring something for $1 off your admission. If your kids are science fans or reindeer fans - the Reindeer Treat event at the Discovery Museum might be the thing for you. Running from Saturday, Dec. 19 thru Thursday Dec. 24 they will have some reindeer science and kids will make a reindeer treat to take home. Probably for the older kids (i.e., not my 2 and 1/2 year old and 16 month old) but it really sounds like fun. The Sacramento Santa Parade is December 12 at 10am - and even if you aren't thinking about coming downtown for that - checking out the California Museum's Charlie Brown Christmas Event is a MUST. Free admission, a visit with Snoopy and fun activities for kids. Plus a mobile puppy adoption. How fun. Another one for reindeer fans - be sure to stop by Fairytale Town between Dec. 10 and Dec. 20 for their Winter Wonderland spectacular. Santa, reindeer and a snow flurry if you are able to stick around till 7pm. All for the price of admission... which is nothing if you are members like us! On Friday, Dec. 11 you can take your kids Sacramento Central YMCA for a swim with Santa! I had to share this because what a unique twist on your normal Santa events. And it is free with a food donation benefiting the River City Food Bank. Of course there are the biggies - like the Winter Wonderland at Cal Expo and the skating / slides at Raley Field. Any others I am missing? Let me know in the comments!